Happy New Year! I hope that everyone had a delightful holiday season and is ready to take on the final year of this decade. 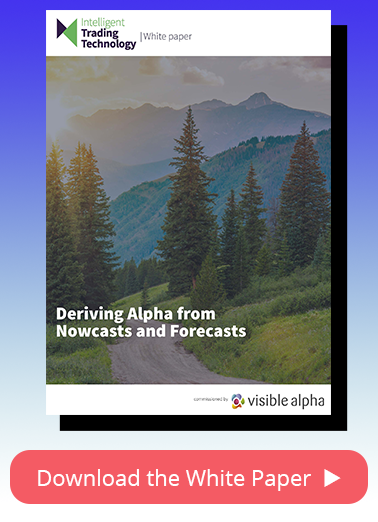 It feels like just yesterday that I was writing a review of 2017, and here we are reflecting on 2018, another year of tremendous growth at Visible Alpha. I’m excited to share my thoughts on the year prior, as well as what you can expect from us in 2019. We kicked off 2018 with exciting news of raising $38 million in a new funding round, which has fueled growth and enabled us to further drive efficiency in the investment research space. The round was led by Goldman Sachs, with additional participation from Banco Santander (through its VC arm, Santander InnoVentures), Exane BNP Paribas, HSBC, Macquarie Group, Royal Bank of Canada and Wells Fargo, as well as from our existing investors, Bank of America, Citi, Jefferies, Morgan Stanley and UBS. With our new partners, we launched a Research Advisory Board to seek guidance from these global financial institutions to ensure product development is focused on the specific needs and regulatory requirements of our clients. We were thrilled to welcome two key appointments to the executive team: Mark Hale joined us as Chief Operating Officer and Rodney Pedersen joined as Chief Revenue Officer. Formerly the COO of FactSet, Mark is leading our growing engineering, product, content management, operations and technology teams with a focus on building automated and repeatable processes to accelerate new product delivery, enhance contributor operations procedures and streamline the onboarding of new research providers. Mark joined Visible Alpha because he was interested in an emerging financial technology company that has a good sense of where the market is heading, and he has great confidence in Visible Alpha’s ability to deliver solutions built for both today and tomorrow. We’re glad to have Mark on board to help shape our company’s solutions. Rodney is leading our sales, marketing and client success management teams to continue our momentum in supporting more buy-side firms with Visible Alpha’s solutions, as well as further establishing great relationships with our current clients. Rodney and Mark are working together to further establish a positive feedback loop with our clients to ensure we are meeting their needs with all of our products and services. Both Mark and Rodney have already proven to be invaluable assets to our company, and I am more confident than ever about the year ahead with their leadership. We’re also proud to see many of the buy- and sell-side firms we work with recognized throughout the year in these same awards programs. The biggest industry change this year rolled out on January 3, 2018 with the EU’s Markets in Financial Instruments Directive II. While the impact on the industry has been greatest in Europe, ripples have been felt across the research landscape. Visible Alpha has been working with our partners and clients to help meet their administrative and compliance burdens, but also to maximize the value of their research assets and services in an increasingly complex environment. In 2018, we received ISO 27001 certification for our information security management system supporting our services. This certification provides our clients and content contributors with the utmost confidence in the quality and stability of security around our content and data. In the second half of 2018, we had our strongest ever sales quarter, growing our client base – with clients such as Metzler Asset Management GmbH and Independent Franchise Partners – to empower more investment managers through Visible Alpha’s products and services. We ended the year with over 600 sell-side contributors adding content to our platforms and have significantly increased company coverage on Visible Alpha Insights. Company coverage on Insights grew to over 9,500 companies and consensus to over 3,500 companies, including a significant expansion in Europe and top companies in Asia. Visible Alpha has made a few leaps and bounds in terms of brand recognition, too. Bonanza Chalaban, Visible Alpha’s product research strategist, is a regular contributor to Forbes.com, where he highlights interesting stories on highly watched companies, such as Netflix, Tesla and Tencent, using Insights data. Of course, these kinds of achievements wouldn’t be possible without our growing, skilled team. We now have just under 600 employees across the globe, adding over 150 talented people to our team in one year. While we regularly release enhancements to our products, we launched a few key features on a few of our platforms. Standardized data: a new foundational data set that presents companies on an apples-to-apples basis was released in mid-year and is available on every single company we cover. The initial offering includes complete income statements, balance sheets, and cash flow statements that makes comparing companies extremely easy and efficient. Revisions analysis tool that quickly summarizes all the changes to analyst models to quickly pinpoint the direction and magnitude of changes in analyst sentiment – and a similar tool to review earnings surprises. Comps table module that leverages our standardized data to quickly compare companies. New charts throughout our data grid to help investors understand the distribution of current estimates as well as the direction and magnitude of earnings surprises and revisions. To learn more about these upgrades, get in touch. Resource Tracking upgrade: Since its launch, our Resource Tracking solution has been adopted by some of the largest and most respected asset managers in the world and evolved to accommodate the changing workflows around tracking and valuing interactions. To keep up with this rapid growth, we made significant improvements to the platform to greatly increase stability, speed up performance, increase transparency into groupings and calculations and allow for platform scalability. We will continue improving this product in 2019. This year, the industry will continue to focus on innovation in an increasingly competitive market to find new ways of discovering and generating alpha. As alternative data becomes more popular, deriving alpha by interweaving ‘nowcast’ and forecast data will become increasingly commonplace. Fundamental analysis will more often be combined with quantitative analysis in a ‘quantamental’ investing strategy. Alternative data – otherwise known as big data – often requires a skilled data scientist to sift through a large amount of data to make sense of it. We’ve been working with clients with a data science approach, offering their quant teams our API so they can find the signal in the noise. In 2019, we will continue to iterate upon our API to better support the workflows of our clients. Along with the rest of the global investment community, we are interested in learning about the results of the FCA’s initial audits regarding MiFID II. Download our MiFID II compliance checklist to ensure you have the right policies, procedures and documentation in place. We also have some big plans for our Insights platform. We will continue to expand our global coverage in 2019 to be able to serve asset managers in all corners of the globe. While we currently provide an unprecedented level of analyst forecast data and consensus on a “normalized” basis – taking all the models on a company and making them comparable across analysts – we will soon extend our standardized data to include industry-specific forecasts items to allow cross-company comparisons on deep operating metrics. This year will also see tighter integration across all of our content sets, including analyst models, forecast and consensus data, research reports and calendar of forward events, in order to help investment managers better utilize research in their daily workflow. As always, we will continue to focus on our mission to increase and improve collaboration between the buy side and sell side. With the addition of Mark and Rodney to our leadership team, we look to improve our methods of gathering and taking action on feedback from both our clients and content contributors to ensure we are supporting and meeting the needs of both sides of the Street. Our team will continue to grow as we hire for key positions in various departments across the globe, and I invite you to check out Visible Alpha’s career opportunities if you’re interested in joining our team. I hope you are as excited for 2019 as we are. To our clients, contributors and partners – we sincerely appreciate the trust that you in place in us with your business and collaboration. We’re excited to continue working closely with you as our company and products continue to develop. To stay up-to-date with the latest news and commentary from Visible Alpha, be sure to subscribe to our newsletter. If you’re interested in learning more about Visible Alpha and how we can serve you, contact us today.